Cloud-based adoption is accelerating the fastest for warehouse management systems (WMS), inventory management and supply network optimization, with IDC predicting a 26.5% Compound Annual Growth Rate (CAGR) through 2019. The Global Warehouse Management System (WMS) market grew to $1.4B in 2016, and is projected to attain a CAGR of 14.1% between 2017 and 2025, with the global market reaching $4.6B by the end of 2025. According to IDC’s research note, WMS In The Cloud, cloud WMS offers a level of scalability that is not possible with traditional on-premise WMS deployments. Transparency Market Research reports the cloud WMS market is expected to expand from $1.2B in 2015 to $4.1B by 2024. Cloud WMS applications help reduce infrastructure costs and enable the reallocation of existing IT resources to drive productivity improvements, according to IDC. Cloud WMS is seeing increased adoption as manufacturers expand globally through mergers, acquisitions and regionally-focused manufacturing strategies. WMS has been traditionally installed on-premise, but that’s changing fast as new business models proliferate, forcing more diverse, higher speed supply chains. Manufacturers, retailers and service providers see how quickly Amazon and other eCommerce platforms are reordering entire industries. For nearly every manufacturer, there’s the pressure of new channels emerging, combined with higher Costs of Goods Sold (COGS) becoming the new normal based on rising material costs. 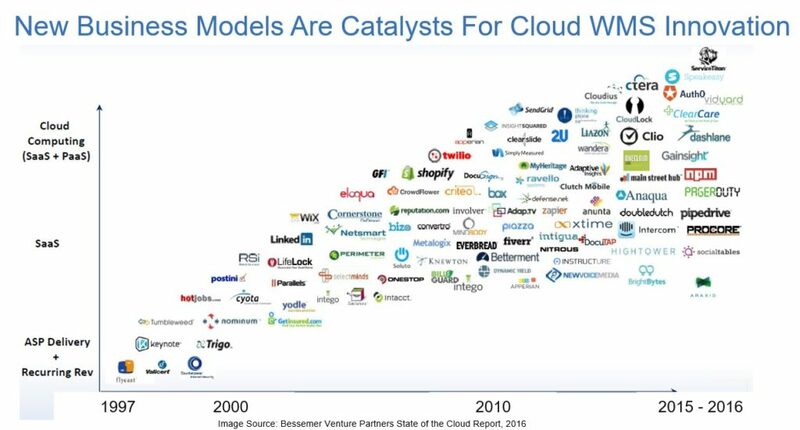 Add to this the proliferation of an entirely new wave of business models that are catalysts for cloud WMS innovation (shown) below), and a new era of WMS is arriving faster than many anticipated. Cloud-based logistics systems are forecast to attain a 19.8% growth rate through 2019. IDC is predicting cloud-based transportation management systems (TMS) and global trade management, two foundational areas of logistics management, will grow more than four times as fast as their on-premise counterparts. The CAGR for cloud-based Logistics is 19.8% through the forecast period, compared to just 4.8% for on-premise. Cloud-based production planning systems are forecast to attain a 16.4% growth rate through 2019. The core components of production planning include supply planning, demand planning and sales and operations planning. IDC predicted that on-premise production planning software will attain a 6.3% CAGR through 2019. New business models that are multichannel or omnichannel-based and often include entirely new pricing models such as subscriptions are becoming more and more popular. These business models are factors making cloud-based sales & operations planning (S&OP) essential. In search of greater speed, more enterprises are relying on cloud-based platforms and architectures to remove the roadblocks that get in the way of attaining more revenue. Look for more cloud-based S&OP deployments by every major ERP provider in 2018 and beyond. Cloud-based adoption is accelerating the fastest for WMS, inventory management and supply network optimization, with IDC predicting a 26.5% CAGR through 2019. The proliferation of new business models that emphasize speed, scale and real-time responses to customers across all channels is the price every enterprise has to pay to compete and win. IDC’s optimistic forecast of cloud adoption outpacing on-premise by over 6 times for WMS and inventory management systems reflects the revolution occurring in business models today. Cloud-based supply chain systems are projected to have an aggregate 20.9% CAGR growth rate of adoption, compared to just 5.1% CAGR for on-premise through 2019. The inflection point has arrived for cloud-based SCM platforms, and WMS in particular. Achieving greater speed and scale of every phase of manufacturing operations through order fulfillment and into service operations all rely on a high performance WMS. Initial pilots across a diverse base of manufacturing industries, combined with the increased scale new business models require, are forcing a rapid migration away from on-premise to cloud WMS systems. The faster cloud platform integration strategies improve and become more streamlined to the application programming interface (API) level, the faster the migration will occur. According to Forbes, 2017 was a transitional year for API development. The global market for WMS applications in manufacturing and retail will grow at a CAGR of 6.47% through 2019, reaching a global market value of $1.32B according to IDC. IDC is forecasting that by 2019, nearly 62% of the global market will be in manufacturing and 38% in retail. Cloud-based SCM systems that are capable of supporting multiple production locations and distributed order management workflows are becoming increasingly common. The shift to cloud-based systems that integrate together at the platform level, combined with entirely new business models predicated on quicker and more precise responses, are two of the many factors driving cloud WMS market growth and the shift away from on-premise systems. Zebra Technologies’ Warehouse Vision 2020 Global Survey finds that the majority of enterprises will be relying on real-time location systems (RTLS) by 2020 (75.8%), followed by fully-featured WMS systems (74.6%). The survey also found enterprises’ reliance on legacy WMS systems will drop from 81.4% to 42.9% by 2020. ERP systems will decreasingly be used for WMS work as business models force entirely new IT structures to support more rapid growth. The increasing adoption of Internet of Things (IoT) systems, solutions and technologies across manufacturing is making cloud WMS a must-have to increase speed and scale of data analytics. More manufacturers are either piloting IoT systems or are using these technologies to accelerate supply chains, warehouses and production. The consensus forecast from Forrester, Gartner, IDC and others is that IoT will be one of the main catalysts driving the intelligent factories, Industrie 4.0 and the need for enterprise-grade SCM and WMS platforms. According to Forrester’s most recent heat map for IoT, inventory management systems and warehouse management systems serving transportation, logistics, retail, wholesale and chemical industries have the greatest potential for growth. By 2020, WMS needs to have a comprehensive yard management system (73%) and on-demand/SaaS/cloud WMS (72.7%) to stay competitive. According to Zebra Technologies’ Warehouse Vision 2020 Global Survey, yard management systems (YMS) and cloud WMS are two of the most important areas of WMS functionality required by 2020. Additional areas of required functionality include an integrated TMS, slotting functionality and labor planning functionality. The following graphic from Zebra Technologies’ survey compares the key areas of WMS functionality required back in 2015 and looking ahead to 2020. Bottom Line: Warehouses are transitioning from cost centers to growth centers while supporting entirely new, higher-speed business models that require greater speed, scale and simplicity of operation. The same dynamics driving cloud WMS growth are also fueling foundational changes to supply chains as well. The inflection point has been on its way for several years, with cloud WMS now beginning to eclipse their on-premise counterparts. On-premise WMS contributed to greater track and traceability through warehouse management systems and increased visibility throughout supply chain networks. Having created a solid foundation of analytics, key performance indicators (KPIs) and metrics, on-premise WMS succeeded in creating stable systems of records for millions of manufacturers and enterprises. Designed for more mass production-based business models, on-premise WMS is not scaling to the evolving needs many manufacturers have today. The urgent need to deal with the four vital areas of out-of-stock conditions, enhancing customer services, increasing core WMS accuracy and improving regulatory compliance is driving the intensity around cloud WMS adoption. On-premise WMS can’t scale across these core areas on their own; they require custom-build integration adapters and connectors. Cloud WMS, however, can scale across each of these areas while providing a system of record capable of tracking WMS activity and providing advanced analytics and logic that make solid gains in reducing out-of-stock conditions. One of the greatest benefits of cloud WMS is the ability to scale intelligence and insight across all locations while providing traceability, which is essential to excel at external regulatory and internal compliance. New business models bring entirely new business challenges, and on-premise WMS can’t keep up with them since they weren’t designed to excel within current or future market constraints. Cloud WMS are now being designed to focus more architecturally on meeting the needs of expanding demand fulfillment, multichannel and omnichannel selling and service. There’s also the exponential increase in mass customization, including build-to-order, configure-to-order and engineer-to-order supply chains that need to able to flex and be responsive. And finally, legacy on-premise WMS often aren’t able to provide the needed inventory management visibility. At best, on-premise WMS provide single-plant visibility, yet don’t scale well to support several global warehouse centers that are moving at an entirely different cadence than the host system. All of these factors are fueling mass migrations of enterprises away from on-premise WMS to cloud WMS.